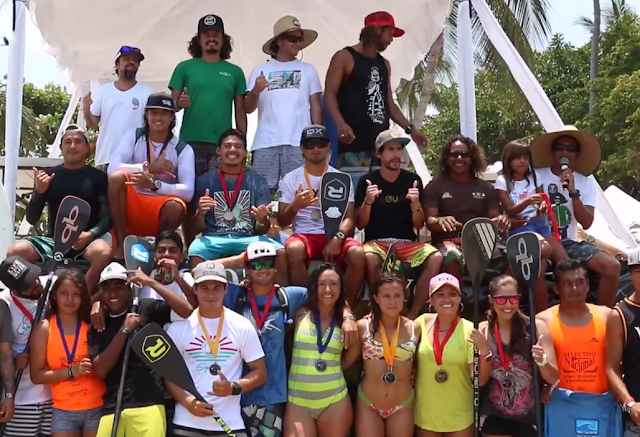 The surfers and paddlers either from Riviera Nayarit’s microdestinations or living there took nearly all the spots on the national team and will be present at the next world championships to be held in Fiji in 2016. The members of the Nayarit State Surfing Association (ASENAY, by its acronym in Spanish) won all of the heats in the 2016 Stand Up Paddle (SUP) & Paddleboard National Team Competition that took place in Sayulita, the Surfing Capital of the Riviera Nayarit. During the tournament several well-known names who had participated in previous world cups upheld their status, including Fernando Stalla, who pioneered this sport in Mexico; Javier “Bicho” Jiménez, a silver medal winner in last year’s world cup; Felipe “Bodoque” Hernández, 2015 bronze medalist; and Felipe “Pipe” Rodríguez, national SUP surfing champion. Erika Benítez, Martha Díaz and Alejandra Brito were the standouts in the women’s league. “We’re very happy to have held this competition here in the Riviera Nayarit; everything went well thanks to the support of the CVB. We hope to hold the next national competition in another state,” added Caselin. Ana Mariscal, from Sinaloa, snagged a spot for Fiji, thus nixing the possibility of the Nayarit-only team. The national team consists of: Fernando Stalla, Javier Jiménez, Felipe Hernández, Felipe Rodríguez, Julio González, Miguel Rodríguez, Juan Varela, Keven Camara, José Rodríguez, Oliver Cruz, Geovani Cervantes, Karen Jacobson, Aida Ponce, Martha Díaz, Ana Mariscal, Erika Benítez, Alejandra Brito, Angélica Estrada and Italivi Fuente.